Located 83km southeast of Lahad Datu in Sabah, the 438-sq. km. Danum Valley Conservation Area is one of the last remaining pockets of primary lowland rainforest in Asia. It is a rugged terrain bordered by the Danum and Segama Rivers, and dipterocarp forests cover over 90 percent of the area. 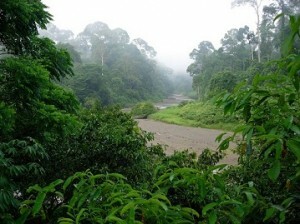 The 60-million-year-old rainforest preserves many plant and animal species found only in Borneo. It is home to over 275 bird species, 110 species of mammals including Orang Utans, five species of deer, giant flying squirrels, gibbons, bearded wild boars, flying frogs, Bulwar pheasants, the Asian elephant and the Sumatran rhinoceros. Free and leisure in the morning or enjoy a guided morning walk at the Segama Trail/ Hornbill Trail. Check out. Depart for 2½ hrs journey to Lahad Datu. * Guides (A guide must be presented for a walks/hikes. No one are permitted to go on walks/ hikes without a guide).